There and their (and they're) are some of the most commonly confused words. They're members of the homophone tribe. That is, they're words that sound alike but are spelled differently and have different meanings. "There" refers to a place-either a concrete or abstract place. "Their" indicates possession. "They're" is merely a contraction for "they are." That one doesn't get intertwined quite as often. It's important, however, to distinguish between there and their; they're dead giveaways of your grasp of the English language. These examples of "there" and "their" in a sentence will help clear that up so you can move on to craft grammatically precise prose. Come over here. Go over there. Sit down in that purple chair over there. Let's go to Greece and eat at Sandy's new restaurant there. Think of "there" as a giant arrow. It's pointing toward a place or position, indicating direction. It also has an abstract function, for figurative places, as well as use in statements of fact, typically in "there are" and "there is" constructs. Put your coat down over there. There is something to be said for telling the truth. There is always another opportunity to be had down the road. The book is right over there. The remote is over there on the couch. Why don't you go over there and tell me what is inside? There are two people in the room right now. There is supposed to be rain tomorrow. I know there is truth to what you are saying. There are so many stores in this little village. I did not know there was milk in the refrigerator. Who knew there was going to be a sequel to the movie? I hope there is no snow tomorrow. I always wondered what was in there. "Their" is pretty straightforward. It always indicates possession by people or things. More specifically, "their" is a possessive pronoun. It replaces the noun in a sentence. Instead of saying, "That's the Murphy family's new dog," you can say, "That's their new dog." The red one is their house. The beagle is their dog. Going to the store was their idea. They're in over their heads. Joe and Sue always want things their way. I didn't know that it was their cat. Their dog is always barking. Why don't you ask them what their plans are? I never forgot that it was their suggestion that started the company. You should stay out of their business. You should stop by their lemonade stand for a drink. Do not take their word at face value. Did you know their house is for sale? Their car goes way faster than your car does. Did you know their new business has taken off? The boat over there is their boat. Put the book over there next to their shelves. There is no way I could know it was their paint. It was always their plan to go to the beach over there. There is always another opportunity to get on their good side. There is no shortage of bugs in their dusty garage. Their trip to the spa fell through when they got there and saw it was closed. Their only hope was that there would be someone to let them in when they arrived. Since their plane was two hours late, they were glad to finally get there. There was a long wait before their luggage arrived at the gate. There was never any doubt that he would go to their old school. There is still hope that their dog will be found. Not too bad, right? The concepts are simple enough. It's just a matter of double checking yourself whenever you need to use these homophones. While you're on a roll, check out the Rules for There and Their to solidify this important concept in your mind. "Examples of There and Their in a Sentence." YourDictionary, n.d. Web. 18 April 2019. 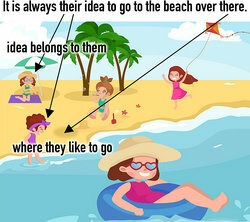 <https://examples.yourdictionary.com/examples-of-there-and-their.html>. There and their (and they’re) are some of the most commonly confused words. They’re members of the homophone tribe. That is, they’re words that sound alike but are spelled differently and have different meanings.“There” refers to a place-either a concrete or abstract place. “Their” indicates possession. “They’re” is merely a contraction for “they are.” That one doesn’t get intertwined quite as often.It’s important, however, to distinguish between there and their; they’re dead giveaways of your grasp of the English language. These examples of “there” and “their” in a sentence will help clear that up so you can move on to craft grammatically precise prose.